Reigning Dunlop Super2 Series winner Garry Jacobson hopes to make his long-awaited Virgin Australia Supercars Championship debut via a SuperSprint wildcard. The 24-year-old has confirmed that he’s working on putting together a deal with Prodrive to run in two SuperSprint events prior to his Pirtek Enduro Cup appearance with the team. He joins a list of wildcard hopefuls that includes Super2 rivals Jack Le Brocq, Macauley Jones and Todd Hazelwood, as well as Garry Rogers’ enduro driver James Golding. As reported last week, wildcards will be available to Super2 teams at this year’s Barbagallo, Winton, Hidden Valley and Queensland Raceway SuperSprint events. “I’m trying to do it, but there are a couple of variables involved,” Jacobson told Supercars.com. “You have to have the right budget and fit in around the schedule of the main game guys. “I’ll be going through all those things with Tim (Edwards, Prodrive boss) and if we do it, we’ll make sure that we’re able to do it properly. “I’ve got great support this year from a variety of sponsors that I’ll be looking to involve in the main game. Edwards says that his team will have no problem adding a fifth car if required, having fielded wildcards in the 2014 and 2015 Supercheap Auto Bathurst 1000s. “From our point of view, we’ve run wildcards before at Bathurst so we’ve got all the infrastructure that we need,” he said. “We’re probably better prepared than anyone else in terms of having a spare fuel rig, a pit boom and all the rest of it ready to go. Jacobson is meanwhile focussed on kick-starting his Super2 title defence this weekend at Symmons Plains after a rough run at the Clipsal 500 Adelaide. 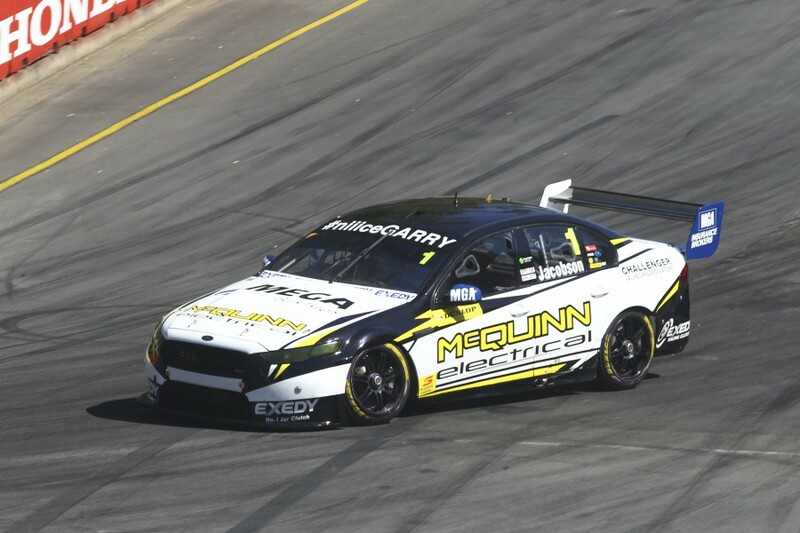 The McQuinn Electrical Ford took an 11th and two sevenths from the three races at an event he won 12 months earlier. While acknowledging that the level of competition has lifted this year, Jacobson is confident of a stronger showing for the category’s debut appearance in Tasmania. “There’s a variety of new things that we were trying and some things worked and some didn’t,” he said. “I was a bit disappointed with the way it went but the category gets more and more competitive every year and if you don’t come with your best package you’re vulnerable. Jacobson will drive alongside Jason Bright in this year’s Pirtek Enduro Cup, while he is also doing selected Sprintcar races for the Queensland-based GW Racing.